These words by Dickens can typify the valleys that we face in our lives. We can say with Dickens that the valley is the worst of times, but it is also the best of times. It is an anxious time. It is a comforting time. It is a time of sorrow. It is a time of joy. It is a time of discouragement. It is a time of encouragement. It is time of confusion. It is a time of direction. It is a time of silence from God. It is a time of closeness with God. The valley is a place of contradictions. If our lives were without valleys, there would be very little spiritual growth. The valleys expose our need for God. The valleys expose the many things that need to be changed in our lives. The valleys teach us faith. Though the valley may not pleasant, there are many verses that bring refreshment to us as we go through the valley. These verses have refreshed me as I have traveled through a valley. In life we often face very dark valleys. How can we keep going as we travel through a valley filled with the unknown, with dangers, and with pain of heart? The loneliness of the valley can become suffocating. There is no one who understands. There is no one to help us get through this rough patch. However, David understood that the Lord’s presence is with us even in the darkest valley of all, death. God never forsakes His children. Though we don’t see Him, we know that he is with us every step of the way as walk through the dark valley. Changes are reality in life. We change. People change. Our surroundings change; Our circumstances change. Our life can often feel like a boat adrift in the ocean; yet amidst the uncertainties of life, God doesn’t change! His Salvation, His Word, His love, His mercy, His comfort, His faithfulness, His holiness never change. These unchangeable truths give us hope as we trod through the valley. 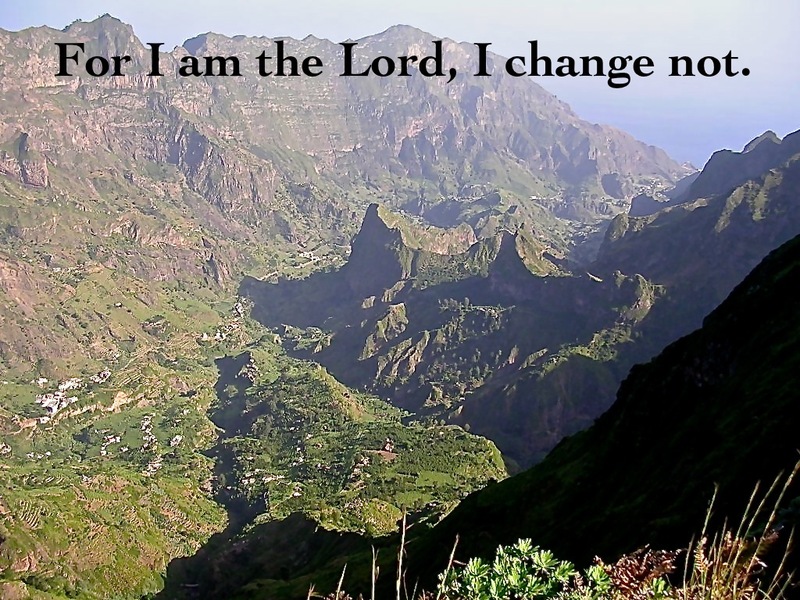 Yes, our world may be changing before our eyes, but God never changes. We need strength and courage for what lies ahead. The path before us looks impossible to tread. We feel tired. We lack sleep. We are emotionally and spiritually exhausted. We want to quit. We think we can’t go one step further. Where can we find the strength and courage to continue moving forward? The same strength and courage that Joshua found from God before crossing the Jordan River and confronting Jericho is available to us. Have you ever found yourself so engrossed in a situation that all you can do is think about it? There is little sleep.There is little peace. There is little joy. What are we to do? When we take our eyes off of the situation and place them upon Jesus, our perspective becomes totally different. When we focus upon the people who may have placed us in this valley, we start to become like them. When we place our eyes upon Jesus, we become more like Him. There is no wisdom in myself, but in you. There is no compassion in myself, but in you. There is no courage in myself, but in you. There is no peace in myself, but in you. There is no joy in myself, but in you. Thank you, Lord, for always being with me, so that when I look to you, you are always there. Amen. The valley can be a place of opposition. You may feel unloved. You may feel alone. This is a time to remember God’s everlasting arms are waiting to embrace and draw you unto Himself. Like a child runs into the arms of a loving parent, We also can run into the arms of our loving Father. The valley produces great needs in our life. As a result of our needs our love increases for the Lord. In spite of situations that are not delightful, we can still delight in the Lord. When we delight in the Lord, He will change our desires to match HIs desires. Delighting in the Lord will enable us to find peace and joy in the midst of the valley. God’s Word has always brought comfort to His people. 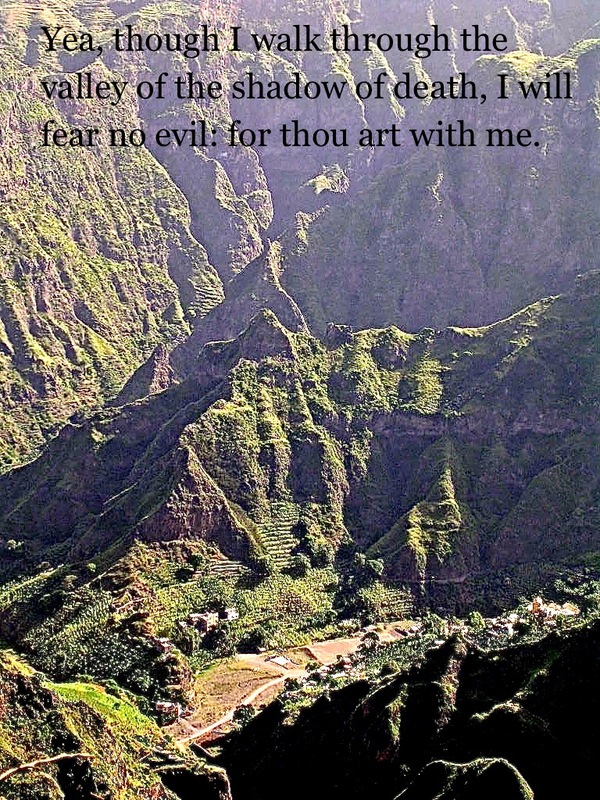 These verses have brought comfort to me in the midst of my valley. May you find comfort in them as you travel through your valley.